Fast Start conversation: People speak loudest with their feet. Markets, in an economist perspective, are all about exits, when to sell, when to cash in. When you pick up and leave you’ve said more than words. Politics deals in having a voice. 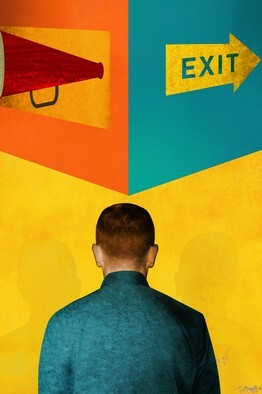 When your voice is most effective is when there is possibility to exit, in a Wall Street Journal article The Choice: To Squawk or to Go?, Roger Lowenstein, reviews a useful approach to dissent in organizations through review of Albert Hirschman. 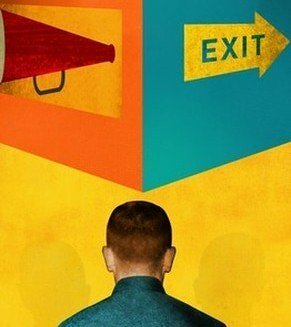 Exit, however rules out a voice and the last leg (to stand on) is loyalty and loyalty holds exit at bay. In our organizations when does the exit outweigh the voice to get things done? I hope all finds you well. – Are you in an enterprise that is Change Averse or Anti-Change? – Have you hit a growth ceiling? – Are the Change Priorities of the enterprise different than the Change your voice is pitching? – Have you done something to lose the trust of those who used to listen to your voice? The driver of whether to stay and keep trying or to leave and try somewhere else is commonly tied to a person’s measure of “satisfaction”, which is personal or subjective. From my perspective your points hit organization culture issues and organization culture rarely changes quickly or frequently. The contrarian voice needs credibility. Unfortunately, it is usually painted into a strident dissent if leadership has not lent constant support for alternative perspectives. As you know, if everyone just said ‘yes’ not much would change and if organizations do not change, they die: to the tune of 50% turnover of Fortune 500 every decade. The stomach to change becomes individual and the challenge is not to lose sense of self or regress to the mean. When employees sacrifice principles, which is both subjective and personal, the organization rarely a benefits; particularly organizations who espouse employee engagement. If organizations want people to fit in, they want average. Not much innovation comes from average. You touched on loyalty here and this is a big factor when an exit strategy should often be ignored because things are not always rosey and going easy. When the going is tough you need loyalty because it stops people exiting out the door. Employee loyalty is a tremendous objective. An organization can hardly expect loyalty without careful consideration on the type of leaders and managers they cultivate, promote, fire, or prune; a first-line manager’s influence provides critical environment to encourage loyalty. Ultimately, loyalty is a rare commodity and has a half life far shorter than people realize. I might say loyalty exists your doors every night at 5pm with no guarantee to return the next day at 8am.